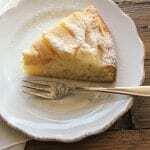 Easy Italian Pear Cake, a simple moist dessert or Afternoon Tea Cake. Made with creamy mascarpone and fresh pears. 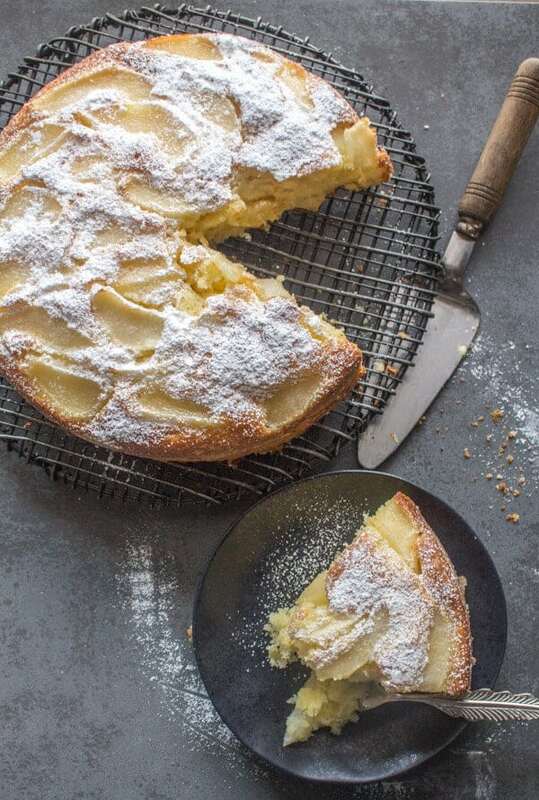 Your new family light dessert favorite, Pear Cake. I remember every Sunday my Mom would make a delicious roast beef and potato dinner. My father of Irish decent was the typical meat and potatoes kind of guy, no pasta for him or at least not very often. I think my sisters and I were more inclined to the Italian side. We couldn’t wait for her amazing spaghetti and meatballs dinner night to arrive. My Dad not so much. I discovered when I arrived in Italy, that Spaghetti and meatballs are a North American invention, and Italians would never serve their spaghetti with meatballs. Spaghetti is a primo piatto and meatballs are a secondo (first and second plates). That was a hard one to get used to and one that I let slip in once in a while. One thing that we all agreed on was dessert and that was always a chocolate cake with a mocha icing (I will have to make that one of these days!). My mother’s best cake, and I have yet to taste one as good as hers! I also discovered when I came to Italy was that Italian cakes, homemade-every-day-cakes were very rarely, if ever, frosted. But most of the times they were dusted with icing sugar or unsweetened cocoa. 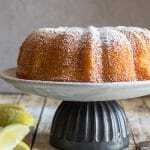 This cake and a my simple Yogurt cake are perfect for anyone who loves a less sweet cake. 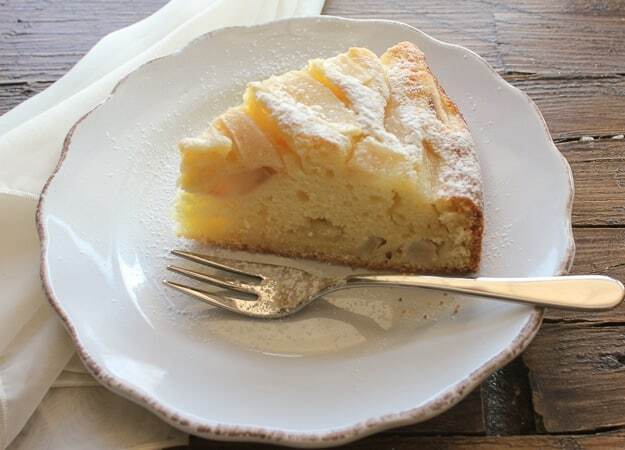 I find this Pear Cake a perfect example of that. It is one of those cakes that make the perfect breakfast cake. And don’t we all love a delicious cake for breakfast? Besides who can refuse the tasty combination of mascarpone and pears? Enjoy! The perfect Breakfast, Snack or Dessert Cake. Clean and peel the pears, one pear chop into medium-sized cubes and the other pear thin slices, set aside. In a medium bowl, at medium speed beat eggs and sugar until creamy, add mascarpone and continue beating until smooth. 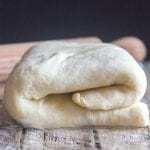 In a medium bowl, whisk together flour, salt, corn starch, baking powder and baking soda. Stir in with a wooden spoon the flour mixture into the creamed mixture, stir gently to combine, then add the oil and stir to combine. 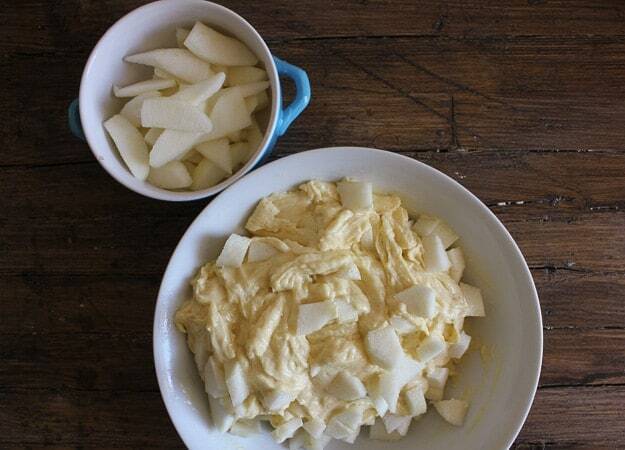 Fold in the medium-sized cubed pear, spoon into prepared cake pan. 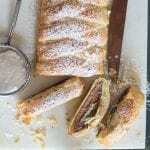 Top with sliced pears and sprinkle with 2 tablespoons (40 grams) sugar (granulated). Bake approximately 45 - 60 minutes, or until toothpick comes out clean. Enjoy! **Today (November 20,2016) I am adding an update to this recipe. I have remade this cake today and I am posting a video because I am convinced even more after making it again that it is one of the best cakes on this food blog. I am sorry if anyone is having a problem with it not baking but I urge you to double check to make sure that you are baking it at the proper temperature, whether Fahrenheit or Celsius. Thanks and Happy Sunday. Great cake, big hit at a holiday party. I used a little less mascarpone (not by choice: basically the contents of a container which was slightly less than 1 cup) and so used 4 T. of oil to compensate. 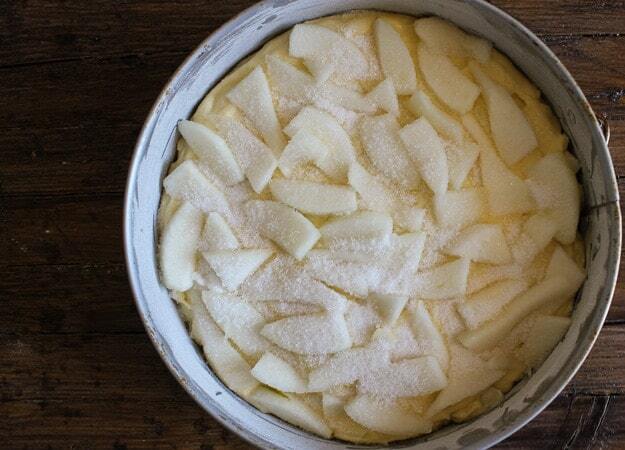 I used olive oil, and 3 pears rather than 2 (I wanted enough pear slices to lay out nicely on the top of the cake). I also added 1 tsp. of vanilla. I’ll be making this one again. Hi Susan, thanks so glad you like the cake. I usually grease and flour the pan, let the cake cool then I take a knife around the edge of the cake and remove the pan. Hope that helps. Merry Christmas. Just made the cake today and added almond extract to the batter – yummy! But at 340 F it took an extra 30 minutes to bake! The middle was still raw batter after 60 minutes. I had to cover the cake with tin foil to prevent the edges from browning too much and upped the temp to 350 F. It stayed in the oven 30 minutes more (with me checking it every 5-6 minutes). I’m guessing it’s the water content of the pears that make it either too wet or too dry. The pears I used were very ripe and juicy. Hi Kelly, yes I am sure it’s because the pears were too juicy. You need firm but ripe pears. Hope that helps. Have a great week. Hello, I’ve been very excited to try this recipe but it turned out quite dry. Even my little’s ones commented on how dry it was. I would like to try it again but will need to cut back on the dry ingredients. Should I cut back to maybe just one cup of flour or eliminate the corn starch? With that what is the purpose of the corn starch in this recipe? Thank you so much! Hi Maria, I really don’t know why it would be dry with all the wet ingredients. But try eliminating the corn starch (corn starch is used to soften the cake) and use cake flour instead. Let me know how it goes. Your welcome, hope you enjoy it. Hi Joan, thanks so much, so glad it was enjoyed. My daughter who doesn’t like pears either loves this cake too. 🙂 Have a great weekend. Can I use an 8 inch cake pan instead of 9? Hi Monica, yes I sometimes do and it will just be higher, and it may need a little bit more of baking time. Hope that helps. I made the cake last night using cream cheese. I just had a piece. It is delicious!! Hi Marie, so glad you enjoyed it. Have a great week. not sure about the 340 American temp? would 325 work if I am using a dark springform? Hi Victoria I would probably go for 350° then. Hope that helps. Happy New Year. did you use a light or dark spring form? Hi Victoria, I really don’t know why the bottom burned at 350°, it shouldn’t have. Maybe you should check your oven temp to make sure it isn’t showing too high. I use a dark springform pan. will do another one this weekend–Bonne Annee! Hi! I made this cake for thanksgiving. It was a hit! Thank you! 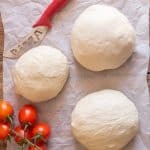 Posted photos and now my family in Italy is asking for the recipe. Could you post the Italian/metric version? Thanks!! Hi Steph, thanks so much and glad it was such a hit. If you go to the recipe underneath it says US Customary – Metric if you click on Metric it will give you the metric version. Hope that helps. Have a great weekend. How do you store this cake. Refrigerate or counter top?? This cake is amazingly good and easy. My family is from Sicily and are very big on fruit. This was a hit. Thank you so much. Hi Laurette, thanks. And I have to agree, my family and friends love this cake. Have a great week. I have homegrown pears that I would love to use for Thanksgiving company. How does this cake freeze? I used greek yogurt. Got great. Hi Edita, great so glad you liked it. Have a great weekend. The calorie count you gave for the cake of 387 is that for the whole cake or is for one piece? Hi Lorna it’s actually for one slice. It’s calculated by the cake being divided by 8 slices, but if you did more slices then of course it would have less calories. Hope that helps. What kind of pears work best? Anjou, Bartlett, etc? To tell the truth I think I used William’s (which I just discovered is also known as a Bartlett Pear) here in Italy, but Anjou would work too. Hope that helps. I’m getting ready to make this and have a question about the pears. I have pears that are tiny little pears so I’m not sure how big the pears you used are. Is there a weight for the pears? Hi Karen, sorry I just saw this now (time difference). The average pear I use weighs 160 grams. (3.5 ounces in 100 grams approx). Hope that helps. Hi Dajana, sorry about that, the recipe has been recalculated and yes it is really good. Let me know what you think. Have a great weekend. Have made this x3 in the past weeks… Pear season going strong.. wonderful !! Used a 1/4 c. Almond flour (replacing a 1/4 c. flour) also sliced almonds on top…,A REAL KEEPER! Hi Jane, so glad you enjoy it. Sliced almonds on top is a great addition. Hi Rose, I made this 2 weeks ago for dessert after a big Sunday dinner. I added a teaspoon of almond extract to your recipe and the end result was amazing! It was just sweet enough and delicious after a big meal. We’re having company this weekend and everyone requested I make this again. Your recipe and directions were very easy to follow. This is definitely one of my go to desserts! Hi Anne, thanks so much and so glad you all enjoyed it, it’s actually my daughter’s favourite dessert. This looks fabulous. I will make it tomorrow for desert after our Swiss raclette. Maybe I will serve it with whip cream, for a more elegant dinner version . I can’t wait to see your chocolate cake with mocha icing. I’m always looking for a great chocolate cake recipe, and can never find one. Coming soon? Hi Louise thanks so much, sounds delicious with the whip cream. Thanks for the reminder, for sure I will have to make that cake you have me craving it now. Have a great weekend. YUM!!! I made this cake this morning for myself and my husband to go with our coffee. My employer sent everyone a huge box of pears for Christmas and they were finally ripe. I had to figure out something to make with them. I didn’t have mascarpone, so I substituted (1) 8oz package of cream cheese (softened). It came out so moist and insanely delicious. Thank you for the wonderful recipe! I forgot to mention that I also substituted olive oil for vegetable oil. I think it tastes yummier in cakes than vegetable oil. Also, because I live in a high altitude area, I added (1) tablespoon more flour. We got 7″ of snow already this morning, so this was a delight to make and have while looking outside at the snow. How lucky you are, I miss the snow. Enjoy. Hi Shawn, so glad you liked it and Cream cheese is a good substitute for Mascarpone. Have a wonderful Christmas. Hi Rose. I’ve just made this yummy sounding cake but with apples as we have a glut of them. Reading your comments, I will say I used your weight measurements, so 250 grammes marscarpone. It took a little longer to cook but the end result is like your photo. Very pleased. We will taste it tomorrow and I’m looking forward to it. Thank you for the recipe. Cathy. Hi Cathy, thanks hope you enjoy it, and let me know, it should be delicious with Apples. Have a great Sunday. Hi again. Your cake was delicious with apples. We will be making it again. Thank you again for the recipe. Hi Cathy, so glad to hear that, I will have to try it with apples too! Have a great weekend. Is it 1c or 1/2 c mascarpone?? Hi Rita, sorry about that it should be 1 cup, thanks. Let me know how it turns out. I am so disappointed. the cake has baked for 1.5 hrs and it’s still wet when checked with a knife. The top is browned I believe from the sugar.. I am not sure what to expect when I try a taste. Hi Josie, sorry to hear that, I just finished baking it again and making a video and it turned out amazing. I think you might have set your oven at the celsius temperature instead of Fahrenheit. (170°C instead of 350°F). Because it baked up in approximately 45 minutes. Let me know. I see vegetable oil in ingredients but I can’t find it in the recipe when should I add it? Any hints about slicing the pear to go on top. Hi Penny, just make sure you peel, core and slice quite thin the pear. And make sure the pear isn’t too ripe, not mushy. Hope that helps. Hi Heidi, so sorry to hear that, I have no idea why, and yes all the ingredients are correct. Did you remember to add the mascarpone? It really shouldn’t be overly dry. Let me know. This cake looks delicious! I wonder if I can substitute ricotta for mascarpone? Thank you! Hi Alma, I don’t know how that would work because they are totally different types of cheese. Ricotta is grainy, and Mascarpone is like a thickened cream, with totally different tastes. If you want to experiment, why not? Let me know if you do try it. Have a great weekend. I have never seen Mascarpone in a local grocery store where I live. I wonder how it would be to use sour cream?! What would you recommend as a substitute if this item cannot be found? Hi Dwan, I found this as a substitute 16 ounces cream cheese, 1/3 cup sour cream and 1/4 cup heavy whipping cream. Blend them together until smooth. Hope that helps. Let me how it goes. Hi Rosie, the original recipe was 1/2 cup which is 125 grams and not 250 (as you correctly said), so I should have corrected the grams and not the cup. I think people used the 1/2 cup of mascarpone. What did you use? I’m sure either would work, just as you said one moister than the other. I wanted to re make it myself but my oven broke. But when I do I will update. Thanks have a great week. Recipe states 1/2cup (250gms) Mascarpone. Well 250gms is 1 full cup. Just made the cake and used all weight measurements. Hopefully it comes out alright. Hi Rosie, yes you are right. Did you use the cup measurements? Let me know what you think. Thanks. I corrected the instructions. I made this cake yesterday for my Italian husband, who loves pears. I wanted to use up a couple of leftover pears I’d poached for a tart earlier in the week and was looking for a new recipe. It was pouring rain and I almost didn’t go out for mascapone (I considered using plain greek yogurt, which we always have in the fridge, instead) but in the end I did go to the store and the cake was a hit. I topped it with a handful of toasted, slivered almonds. Hi Robin, so glad you enjoyed it, sometimes it pays to go out for missing ingredients. 🙂 Have a great day. 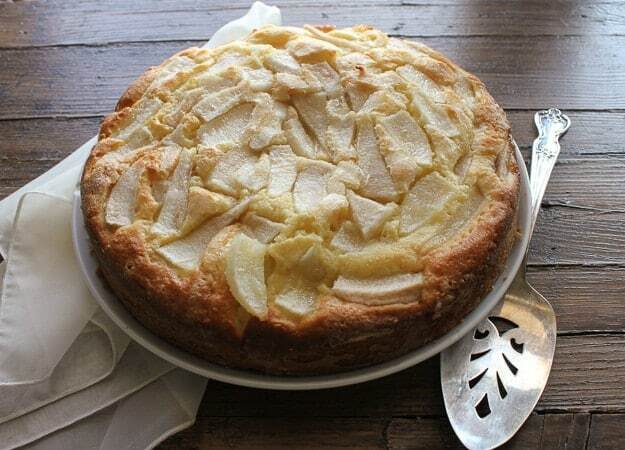 This pear cake looks delicious!! I have a couple of questions before I attempt it. My first question is should the pears be ripe? And the second question is the sprinkling of sugar…is it just regular granulated sugar? I hope to hear from you soon because I would love to make this as one of the desserts for our Canadian Thanksgiving dinner for Sunday night. Hi Diane, I used firm but ripe pears (so not overly ripe/mushy) and yes granulated sugar. Let me know how you like it. Have a great weekend. Made this Sunday night for the family dinner. It was delicious. Served it with a little whipped cream on the side. A big hit. Thanks for posting this one. Loved it! Hi Joaquim, so glad you all enjoyed it! Sounds great with the whipped cream. Made this for the family dinner on Sunday. It was delicious. A big hit with everyone. I severed it with a little whipped cream on the side. So good. Definitely will make it again. Thanks for putting it up! This looks so tasty! I would serve this anytime of the day. I hope to visit Italy some day. Hi Tina Marie, thanks hope you get to visit Italy. 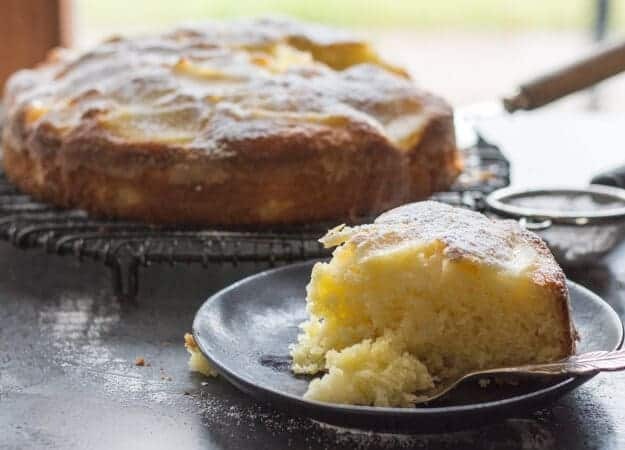 This pear cake looks fantastic for breakfast! It’s so fun to learn about Italy from your travels. Who knew the meatballs weren’t Italian? My mother is German and this dessert looks like something she would have made. I think this would make a perfect summer dessert! Thanks for sharing this great post at the This Is How We Roll Link Party. I can’t wait to see what you bring next week! I am sharing this on one of my social medias! This looks really delicious, thank you for sharing. I’m always looking for great pear recipes because my husband loves them! I stopped over from Inspire Me Monday. Hi Jessy, thanks hope you and your husband enjoy the cake. Thanks for stopping by. What a beautiful cake!! Thank you so much for linking up at Tasty Tuesday! Your recipe has been pinned to the Tasty Tuesday Pinterest board! Please join us again this week! Hi Katherine, thank you, I will be sure to share. Visiting from Tasty Tuesday. I’m not a huge fan of pears but this cake looks perfect to accompany a mug of tea. I would love for you to stop by and share this and other recipes with us over at Sweet and Savoury Sunday. Have a great day! Hi Sophia, thank you, have a great day! That looks so good and moist! I love pears — so many people forget about them and do more apple desserts. I’ll have to make this cake. By the way, great minds must thing alike 🙂 I made a pear dessert this week but it wasn’t anything fancy. Hi Marisa, So true, pears are so good to bake with, very under-rated :). Have a great Sunday. This looks lovely, I’m going to try it this week. Hi Kathryn, thank you let me know how it goes. Have a great Sunday.